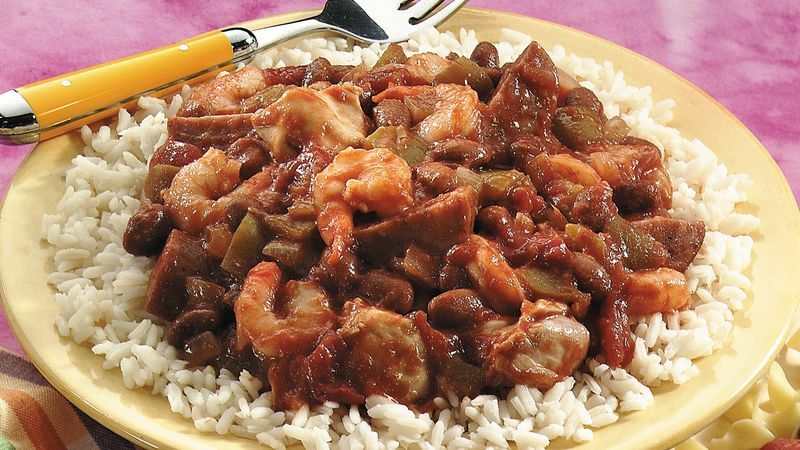 In 4- to 6-quart slow cooker, layer all ingredients in order listed, except shrimp, sausage, rice, water and pepper sauce. About 10 minutes before serving, gently stir shrimp and sausage into chicken mixture. Remove and discard bay leaves. Increase heat setting to High; cover and cook 5 to 10 minutes longer or until shrimp and sausage are hot. Meanwhile, cook rice in water as directed on package. Serve meat mixture over rice. Serve with pepper sauce.